The 21st Century is full of opportunities for those businesses who have the ability to lead the pack through innovation and dedication. As you consider the moving company innovation your business can offer, be sure to consider the following as they can give you a solid advantage over the competition. Some innovations are merely ways in which you conduct business while others come from the way you perceive entrepreneurship. Practically every business has a social media page, but that doesn’t mean that every business is using their social media presence effectively. The best way to use your presence is to give your customer’s information they can use to make their moves go smoother and cost less. Creating YouTube videos, eye-catching infographics and blog posts full of useful tips and advice will go a long way towards turning your social media presence into a revenue and reputation generating machine. The easier you make it for clients to order services, access their accounts, and track their shipments, the better the results will be for your business. Make sure that your business has a solid, mobile friendly website that clients can enter and access all the information they need. You don’t have to reinvent the wheel to innovate. You just need to find a way to make the wheel work better and more efficiently. Innovative ideas can come from staff, customers, and the competition. All you have to do is listen to what they are saying and what they are asking for. You may discover that minor alterations to your containers or changes in your delivery procedures can add considerable usability and value to the services you provide. Innovation takes more than talent; it takes raw effort. Dreamers do little more than dream while innovative leaders surround themselves with bright minds and motivated people. Whether you are hiring front office staff, hiring welders to modify a delivery truck, or contracting an architect to design a new storage facility, innovative leaders are willing to spend the extra money required to bring talented minds with strong work ethics onto their team. 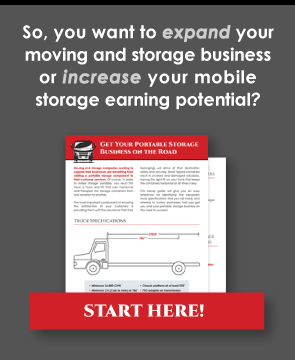 Determine what you envision to be the future of the mobile storage and moving industry. Your vision might include everything from the use of robotic cranes to the incorporation of live-streaming video that clients can use to communicate with delivery drivers. The reality is that there are many amazing technologies that exist that will be incorporated by the competition in the future. Innovative businesses don’t wait for the future to arrive; they take steps now to incorporate the latest technologies into their operations today. Moving company innovation is always a risk and there is no guarantee that your innovative ideas or designs will catch on or work the way you envision them. Innovators recognize that innovation is a gamble and are willing to put in the time to research and test their innovations to minimize the risks and work out the kinks before launch. Some work, some fail, but all teach the company lessons that can propel it forward. Successful moving company innovation requires taking the tools you have and making them more effective. Sometimes, it involves creating tools that your clients need, but don’t know they need. But, most importantly, innovation boils down to the way you perceive the moving industry and the ways you can move it in the direction that you envision its future.